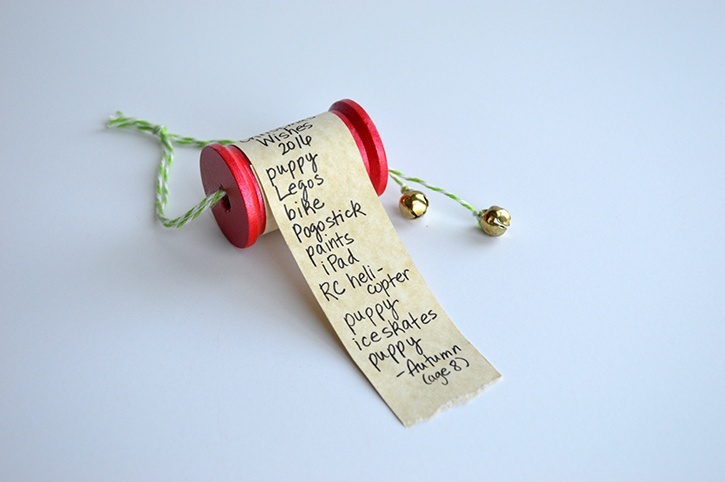 This clever ornament is easy enough to make that everyone in the family can make and personalize their own. Whether you have big wishes or small, this wish list ornament will make for a darling keepsake in the future when you consider Christmases past! Lightly sand the wood spool to knock off any imperfections. Wipe clean with a paper towel. Paint one coat of paint on it. Allow it to completely dry (30 minutes). Then repeat with a second coat and drying time. Tip: Be sure to shake your acrylic paint well before use. While the paint is drying, cut your parchment paper to 1.5 x 11 inches. Tear a small edge off of the bottom for added interest. Starting approximately 3.5 inches down the strip, write out your Christmas wish list. Tip: You may want to add a title, date, and the name/age of the child for future reference. 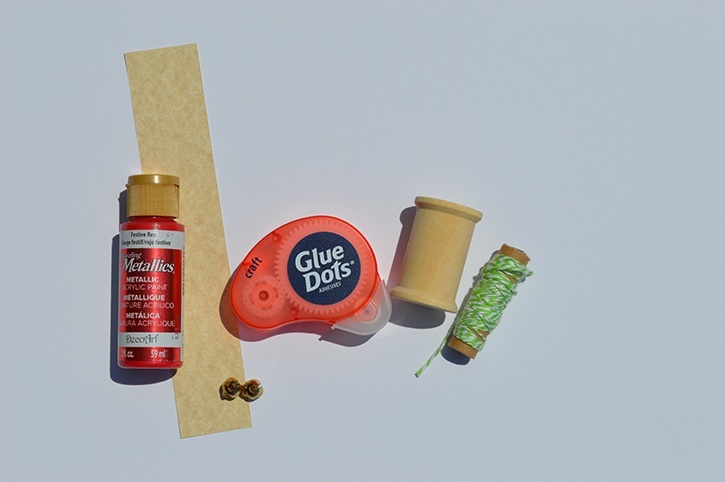 When the painted spool is completely dry, use Craft Glue Dots to wrap and secure the parchment strip on the spool. Let one end of the paper hang down. Cut two pieces of twine about 12 inches in length and thread through the spool center. Tie at the top. 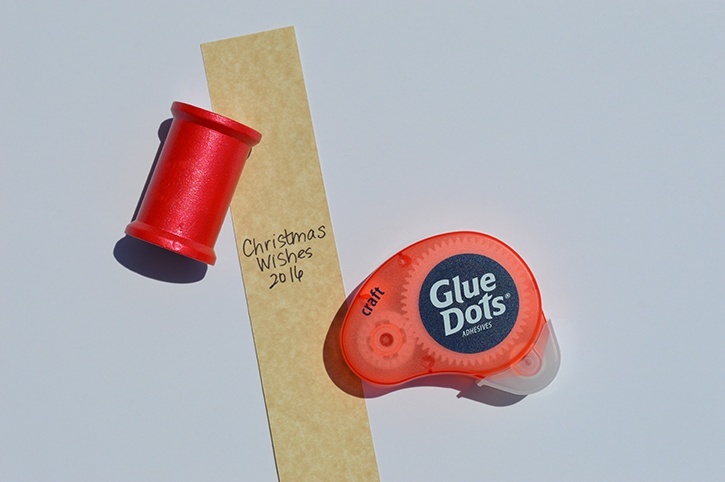 Cut off additional twine and add it to the side of the loop, knotting the jingle bells on each end. A fun project to do as a family this year…and one to cherish as an heirloom in the decades to come. 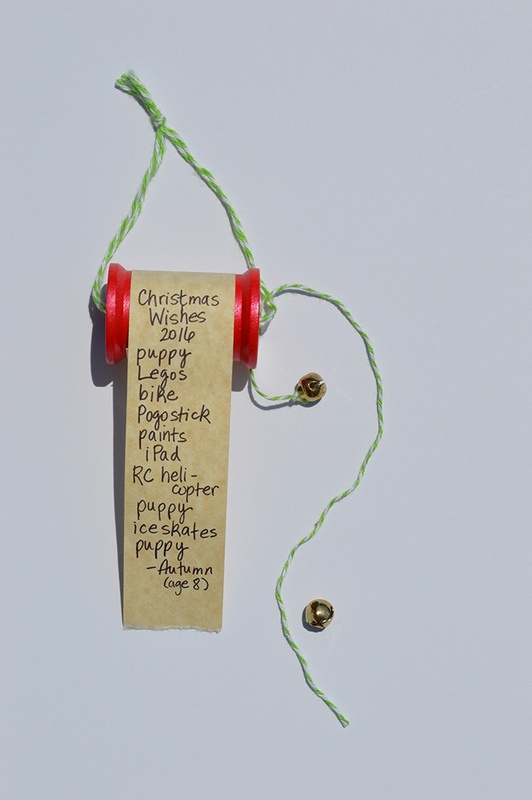 Spend time with your family crafting and wishing about Christmas this year as you create this Christmas Wish List Ornament. P.S. Check out additional Christmas Ornament ideas here.